Far be it from me to think that I know better than the grand dame of newspapers, The New York Times, but I gotta admit to not having liked an article I read the other day on gratitude. Being that this blog is all about that topic, I thought I’d weigh in. Barbara’s Ehrenreich’s article “The Selfish Side of Gratitude” sees it as an egotistical occupation, that doesn’t give enough credit to others in its practice. I don’t see the gratitude game that way. I would look at the above scenario and the gratitude I’d pull out would be that I had a job. Does that make me a chump? No, it makes the agita in the middle of my chest settle. The practice of gratitude is not about comparing yourself to someone else (“I should be making more money, like those selfish Walton’s.”). It’s about being keenly aware and thankful for what you currently have in your life. It’s asking yourself to honor the milk in the fridge, that super warm fuzzy blanket on your couch, the fact that your miserable cold finally went away. It’s about what YOU ALREADY POSSESS THAT YOU OFTEN OVERLOOK. This is powerful stuff. It turns the “I want more”, or the “I want what they have,” into the “Hey, look what I already have!” It isn’t political. It’s not meant to be judgemental. It’s meant to make you recognize what’s in your midst, what you are lucky enough to have. 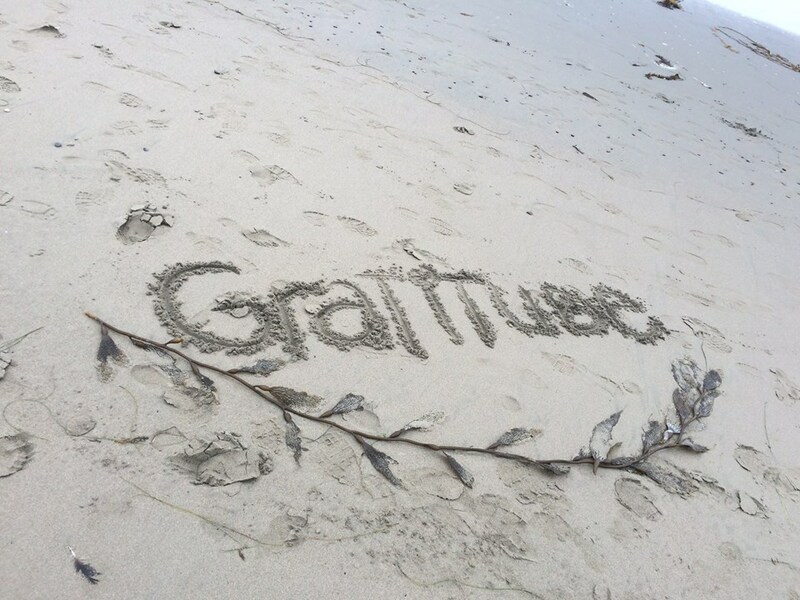 I do what I call “big picture thinking” when it comes to gratitude. I go broad. I look at everything I have as icing. This kind of thinking– focusing in on stuff that is good, that I possess–gives me an inner peace, and makes me feel positive and thankful about what I already have, no matter how small, or how extravagant. This doesn’t mean I have stopped wanting things, or aspiring to having more. It simply means, my eyes and my heart are open and aware of what’s right in front in me. The feeling of being grateful for what you have is the like the opposite of being jaded, which is to not even notice what you have, because you have so much, or because you’re caught up in wanting more. FEELING GOOD AND NOTICING WHAT YOU HAVE IS THE MONEY SHOT. 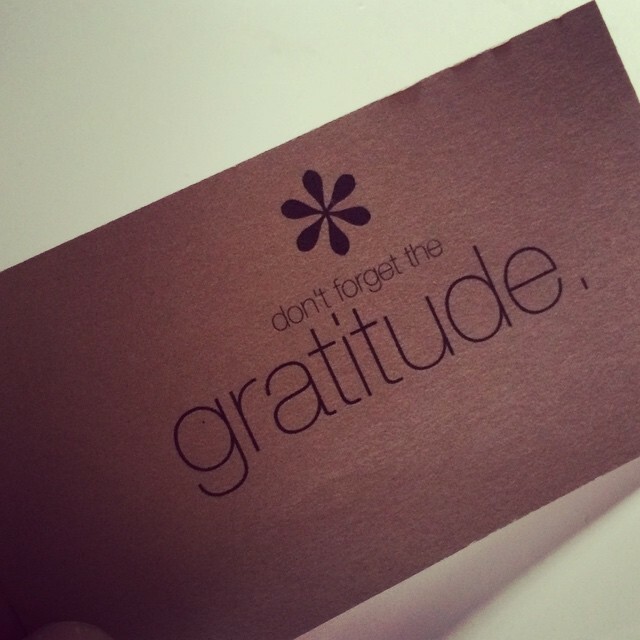 For me, gratitude also includes letting people know I appreciate them. I make sure to thank the people I interact with during my day, Mary at the dry clearners, the guy who holds the door open for me at the grocery store, the person in the dog park who lends me a poop bag. I know for me, the demons of not thinking I have enough are dispelled by making myself take a look at all I am lucky enough to have. A dog, a good mascara, indoor plumbing, access to crusty french bread, baby! While Ms. Ehrenreich considers gratitude to be something similar to masturbation–a lone pursuit–I would argue, sure it can be, but being grateful, even if it is only ever acknowledged in your own head, makes for a better person. A better person, ultimately, makes for a better world. Selfish? I don’t think gratitude can be selfish. I think it’s a way to process a world that is overrun with constant wanting, getting, and having. I think if you can see the good fortune in what you have, no matter how small, your insides will feel rich, calmer, and more content. That’s a good thing. I’m quite sure. she is obviously a smart woman, but i think she really got this one wrong! happy new year, rochelle!